The Profile section allows you to configure the current selected profile. If you are not running a WordPress multisite there will be only one profile available. The name of the current profile. The name is used to distinguish between multiple profiles. If you have purchased a license you have to enter the support license key here. With this option you enable or disable the core parts of the Next Active Directory Integration plug-in. This option is required in a multisite environment if you want to deactivate Next ADI for specific sites. In a single site installation this option should be always enabled. To prevent leaking sensitive information inside a multisite environment you can disable additional menu entries of Active Directory Integration. There is no option for disabling the menu entry Configuration because otherwise the Configuration page would be no longer visible for blog administrators after having enabled such an option. In a single site installation all of the Menu checkboxes should be enabled. If enabled the Test authentication menu entry is shown. If enabled the Sync to AD menu entry is shown. 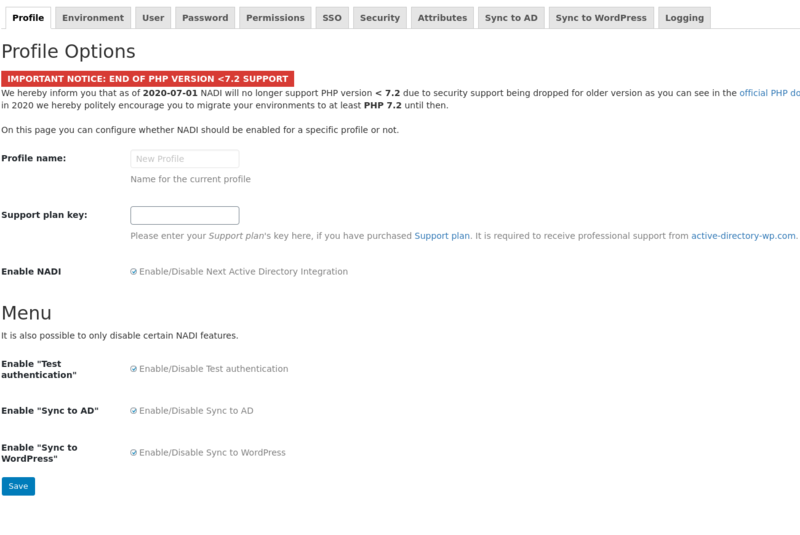 If enabled the Sync to WordPress menu entry is shown.